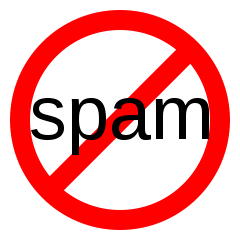 Akismet is the program on WordPress which seeks out spam before it gets to the comments folder. Once a genuine comment arrives, on my site at least, it awaits moderation by myself unless the author has previously submitted a comment which was subsequently allowed; in other words first-time comments are vetted. I am often intrigued by the spam blocker and how it determines which comments are spam and which are genuine comments. Below is a list of the past six month’s activity for all the geeks amongst us……..
With this sort of accuracy and the added safety net of self-moderation this site is well protected from nuisance comments. Incidentally the false positives are usually placed in the spam folder so they can be assessed before the spam is deleted. It pays therefore to glance through the spam folder before deleting it. After thirty days everything in the spam folder is automatically deleted and missed false positives will go down the pan too if not rescued beforehand. Personally I check the spam folder regularly and then manually empty it. Just a habit I got into. They do use strange words to describe things don’t they? Next Next post: Spring at last?